Based in downtown Sudbury, Native People of Sudbury Development Corporation (NPSDC) was incorporated in 1975 with the mandate to provide social and economic welfare to persons of Native ancestry by providing safe, good quality, low cost housing. The non-profit charitable organization is governed by an active seven member volunteer Board of Directors. The Native People of Sudbury Development Corporation office is managed by an Executive Director who supervises a staff of three employees. 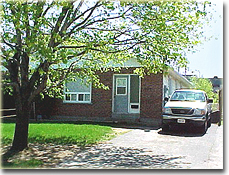 Between 1975 and 1983 the corporation had purchased and was managing eleven homes in Sudbury under Section 15.1 of the National Housing Act. During the following ten years the corporation purchased and built homes under the Urban Native Housing program subsidized by the federal government and administered by Canada Mortgage and Housing Corporation. 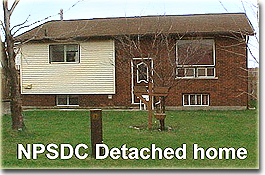 This resulted in a total portfolio of 106 housing units, eleven of which are located in the town of Espanola, Ontario. The corporation's assets are estimated to be worth in excess of 7.4 million dollars. Native People of Sudbury Development Corporation's portfolio is comprised mainly of scattered detached, semi-detached, and duplex housing units. The corporation does, however, own and operate a bungalow style six-unit Elder's building, three townhouse developments and two apartment blocks with stacked units. Tenant rent is based on income and includes a fridge, stove, water, and heat. Domestic hydro used for cooking power and lights is an additional charge. Tenants are required to provide evidence of their incomes in order to qualify for the geared-to-income rents offered by the corporation. In addition to the geared-to-income rents, the corporation offers a tenant liaison service. The Native Tenant Liaison Officer assists tenants to obtain community services, makes referrals whenever required, provides liaison between the Native People of Sudbury Development Corporation office and tenants, and publishes a quarterly newsletter. Tenants are encouraged to contact the Native People of Sudbury Development Corporation for assistance or direction whenever the need arises. Maintenance of Native People of Sudbury Development Corporation homes is an important priority. The Maintenance Supervisor ensures that emergency, routine, and preventative repairs are completed in a timely manner. Applications for housing are usually submitted to the Office Assistant, who is also available to answer any general questions about the corporation. Applications may be obtained by visiting the Native People of Sudbury Development Corporation, by telephoning during office hours, which are from 8:30a.m. to 4:30 p.m. Monday to Friday inclusive, or by using the online forms available on this website.